A child carries empty jerry cans to fill with untreated water from a nearby tap. The men pedalling the liquid loads earn a small income, but when you’re living in one of the world’s poorest countries, any income is welcome. 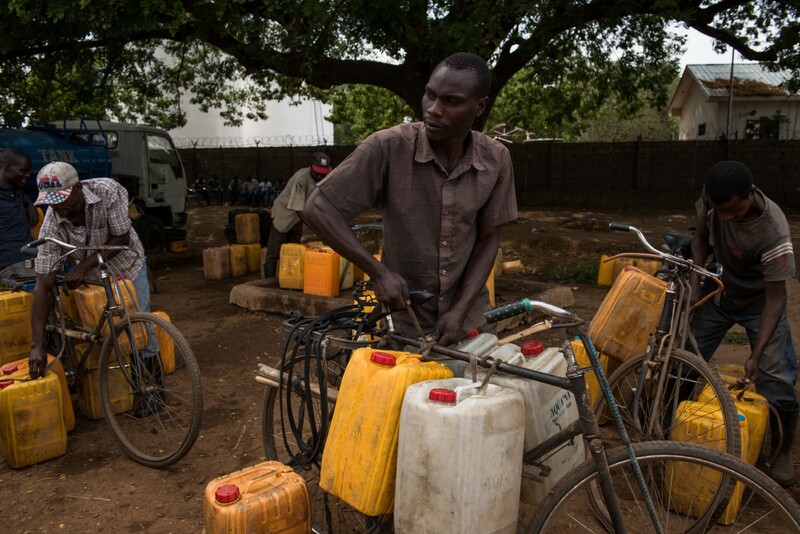 The bicycle water sellers collect safe, clean water from taps connected to UNICEF treatment units, and deliver them to neighbourhoods around Juba. Each can sells for around US 10 cents, which sounds cheap, but it’s almost ten times what a can cost before the crisis in South Sudan began. South Sudan is already struggling with famine, conflict, extreme poverty, and drought. Now, access to safe water has also reached crisis level. Three years ago just 13 percent of Juba residents had access to municipal water, mainly through a small pipe network and boreholes. Since violence erupted in the city last year, that number’s dropped further. 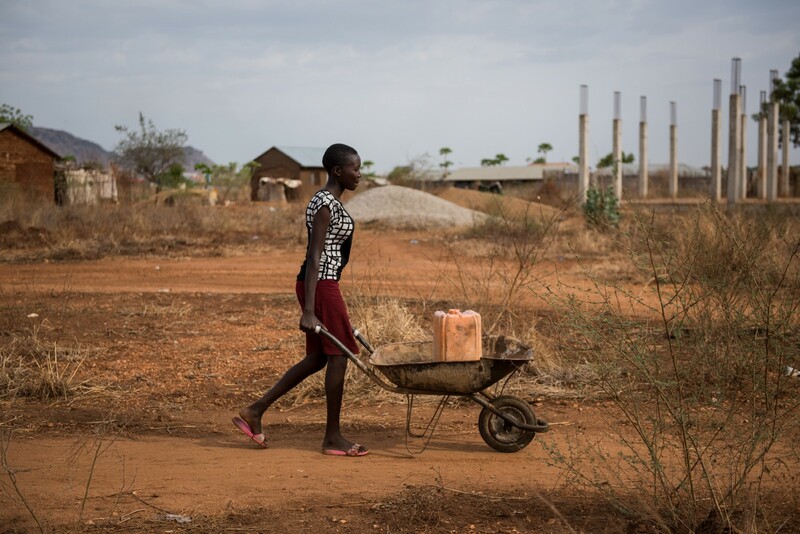 Every day, seventeen-year-old Amal collects untreated water from a tap on the outskirts of Juba, pushing her jerry can in a wheelbarrow. 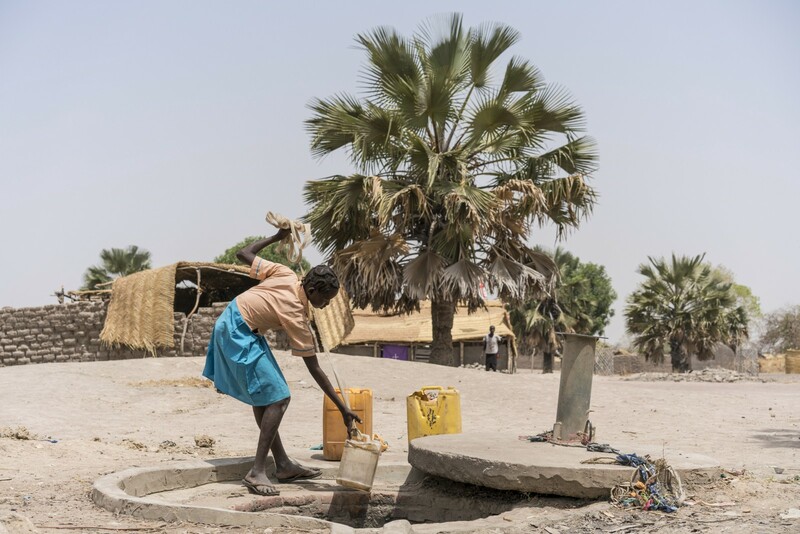 “I don’t have to walk to the river any more, which means I have more time to study, but the water is still dirty, and I worry about my younger siblings getting sick when they drink it” says Amal. 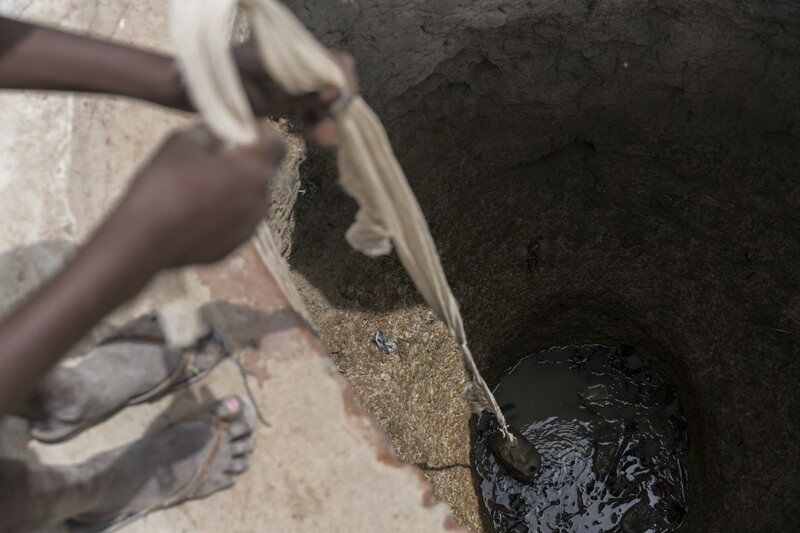 A cholera outbreak which started in July has already killed nearly 100 people and infected almost 4,500 others. 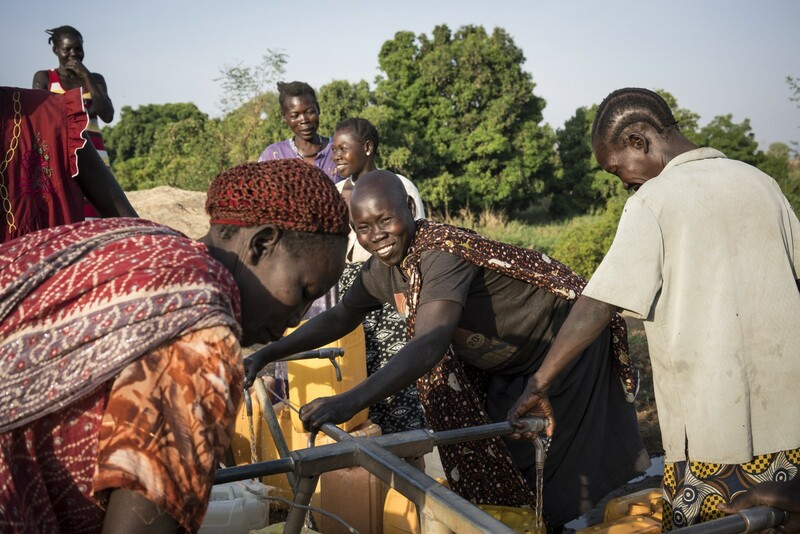 Throughout South Sudan, only 41% of children have access to safe, clean water. Many children miss out on school because they’re required to collect water. Others miss school because of illness caused by unsafe water and sanitation. For most people, water is mostly provided through private water trucks. Every day, up to 2,000 fill their tanks with untreated water from the White Nile, meaning even bought water, can be bad water. Outside of the cities, it is even more difficult. 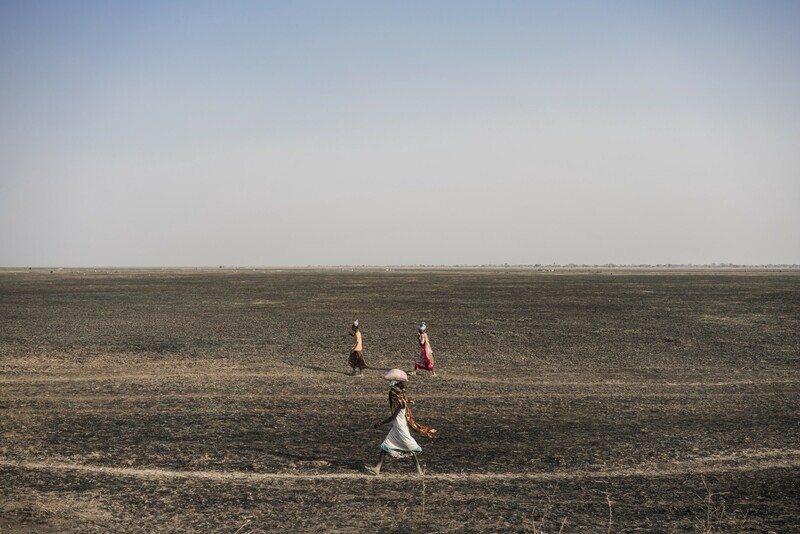 The lands are parched, sources of water increasingly hard to get to. Every day, 15-year-old Abuk Garanag walks four kilometres deep into the bush with an empty can, carrying 25 litres of water on her return trip. “I get scared sometimes because something may happen to me as the fresh water is so far away,” she says. The lack of safe water increases the risk of deadly waterborne diseases spreading, and children are especially vulnerable. A malnourished child is nine times more susceptible to disease than a child who is not malnourished, and across South Sudan millions of children are suffering from degrees of malnutrition. In order to provide safe water and combat the spread of disease, UNICEF is installing water treatment units in communities throughout South Sudan. 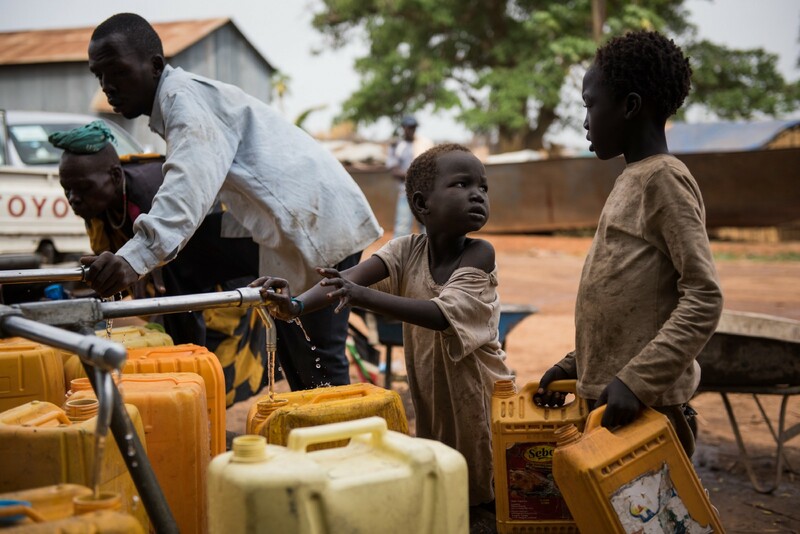 In Juba, the thousands of water trucks supplying urban populations are being provided with chlorine mixtures to treat the river water. The chlorine solution is mixed up in huge tanks, before being transferred to the tankers. It’s a relentless task, but help isn’t hard to find. 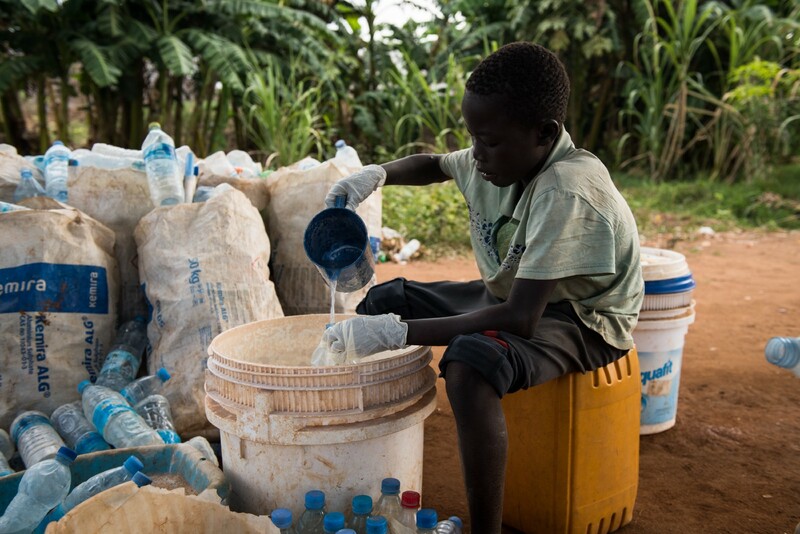 Every morning before school, 13-year-old Francis Ogali mixes up the chlorine solution to be be diluted in the water trucks. He also works all day in the weekends at the site, using the money he earns to buy school supplies and food. Like Abuk, Amal, and the bicycle water sellers he’s doing whatever he can to make life easier for him and his family, in one of the most difficult places on Earth for a child to grow up.